An aquaponics system is a reliable survival food source for your family in times of chaos. Stored food will never give you all the proteins and vitamins you need to thrive in a doomsday scenario… that’s why aquaponics is a good addition to your survival plan. The water temperature of your system. What kind of food your fish will need. Arctic char is a cold-water fish native to the Arctic, sub-Arctic and alpine lakes and coastal waters. Silver Perch are native to the Brisbane area (Australia) and handle the cold very well. Yellow Perch are also cold water fish. They tolerate lower dissolved oxygen and adjust well to pH changes. This type of fish eats common pellet fish foods and veggies. Trout grow in colder climates and can handle winter well. Cod and Salmon need very fresh and cold water, so are not well suited to the recirculation systems. Observation: Keep in mind that the cold water makes the selection of plants more limited. Be careful because these cold water fish live in a temperature range between 50 and 68 F.
Tilapias are a tropical fish species. They tolerate pH shifts, temperature changes, high ammonia, and low dissolved oxygen. They are omnivorous fish so they eat pellet fish food, duckweed and veggies from the system. Catfish thrive in warm water and prefer a temperature of 80 degrees F.
Bluegills prefer warm water with abundant vegetation. They can tolerate temperatures up to 95 F.
Sunfish is a native tropical fish as well. Other warm water fish species: Pumpkinseed, Black Crappie, White Crappie, Ozark Bass, Sacramento Perch, Warmouth. .
Koi fish are brightly colored, miniaturized Carp. Koi are tolerant to a variety of water conditions. Goldfish are also miniaturized Carp and like their relatives – Koi fishes, they thrive in any water conditions. Hybrid Striped Bass are resilient to extreme temperatures and to low dissolved oxygen. The second aspect that you must consider is the type of food you’re able to provide for your fish. Here’s a list of what type of food your fish can eat. Koi/ Goldfish: You can feed them greens like peas, cucumbers or lettuce. Make sure to chop it small enough so that they can fit in their mouths. You can also give them bread crumbs. 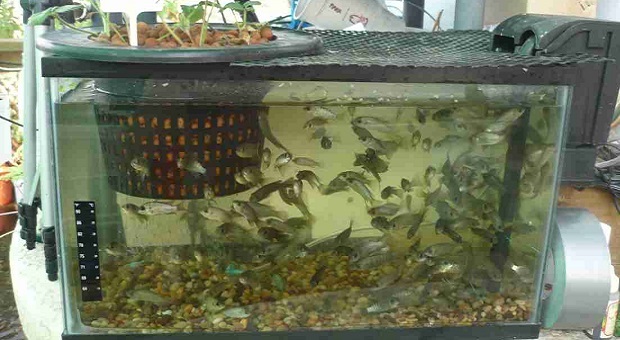 Tilapia: They love plants, especially protein-rich duckweed. Catfish: They love to eat sinking carnivore pellets, prawns, algae wafers and smelt. Observation: Fish food is not universal. Different fish require different food. And finally, the third aspect you must keep in mind is that your aquaponics fish have a purpose. You can choose to keep your fish for circulating the system and have ornamental fish, but you can also add fish to use later as a food source. Alec Deacon is the owner of Backyard Liberty.com. He’s very passionate about survival and he’s constantly looking for the best ways to protect his family - his wife Ana and the two boys, David and Andrew, that are the world to him. He used to work as a hygiene officer in a well-known US company, being in charge with food safety. 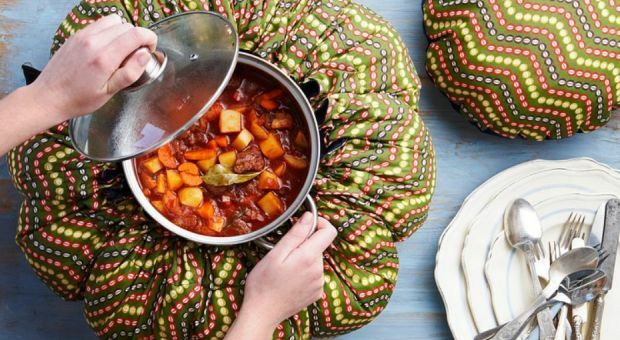 In the time spent there he learned a lot about food: cooking, storing, freezing, transporting… basically everything that has to do with food safety. He is also a huge fan of outdoor living. Fishing carp is one of the things he loves most and it just happens that fishing is also one of the oldest and most basic survival skill. I liked all of your info on the fish and temps. Thank you for sharing this. This confirms what we want to choose for our aquaponics solution – tilapia. We live in Central Texas, so, while it can get cold here, more times than not, it’s hot. We also want to be able to eat the fish from the system. I like that they eat duckweed, that can help remove excess nitrogen from the system. Sounds like a win for us all the way around. I raised trout in a pond with lotsa predators, in Northern Idaho, it still worked. For an enclosed environment, like aquaponics, you will still have to pay attention. All in all, the systemic concept makes sense. Tilapia sounds like a good mix of survival needs. It begs the questions, where do I get the fish, and what is the best diet for them? I’m in San Antonio, had hundreds of fish in a 28ft round above ground pool. When temps went below 50 for 24/7 for over a week water temps dropped below 50. Lost all fish, over 275lbs of them, all ages…..at least I was able to feed my pigs good for a week. I have not restocked until I can make sure I can keep the water temp up during winter. Looking at trying a regular 16ml solar pool cover and maybe wrap insulation around the metal sides of the pool. I had just a plastic cover previous winter and it worked, just that wind storm destroyed it at the beginning of this past winter and I didn’t get it replaced in time. My point, is have a backup ready for those cold winter nights and 40 deg. days with Tilapia. How can very cold water be circulated for trout, cod and salmon and still be able to grow a garden in such cold water temperatures? Will a garden still grow the same amount in cold water as it would in warmer as for Talapias? If you are growing only greens, you can allow the temperature to go as low as 40 F at night. Alec Deacon has delivered information that may very well be the key to living through what is headed our way. Now is the time for all wise men (and women)to come to the aid of thier families, by being prepared to feed them when bad times overtake us. Tough call, I live in a area of single digits in the winter time, a temperatures in the 90’s during the summer. I like the idea of Bass. I have been considering a worm farm as a source of fish food and fertilizer for my regular garden. I have very similar temperature concerns since I live in Colorado. Is this system something that needs to live indoors or outside? If it is in my basement, the temps are much less extreme. Not crazy about having it in the finished part of my house, but if it has to be indoors, I don’t have any other choice except the chicken coop where I no longer have chickens, but it is NOT insulated. I live in the mid-Atlantic region, along the coast. Here the temps are pretty toasty in the summer, but in the winter it gets pretty frosty – we can certainly have long stretches of below-freezing temperatures. Will tilapia (my preferred choice) survive that? Do I need to heat the water somehow? Maybe I could make a solar heating system, but if there’s no sun for a stretch, that would also need a back-up. Any thoughts? Will tillapia survive water that freezes over in the winter? No, it will not. Get an aquarium heater. I like the idea of supplementing our diet with fish but how do you keep a system going if chaos happens, i.e. buy fish to grow etc.. I live in florida and can’t find these fish at a reasonable price. My tank would have to be around 150-175 gallons. Would this be a feasible size to use as a food supplement. I have a small system in the house, the grow bed is a 2 foot by 4 foot bed and the fish tank is a horizontal 45 gallon plastic drum. I have 24 trouts in the tank and 28 plants in the bed. The bed is a floating bed and houses primarily herbs. In my shed, I have my 250 gallon tank and a 3′ x 4′ grow bed with an additional 4′ x’ 8′ grow bed. I will be raising 200 trout to start and the water there will be much colder than the house system to better raise the trout. The trout in the house unit will move to the large tank and I will then get some Talapia for the indoor system. Start small and add as you go. An IBC can hold 330 gallons and are dirt cheap, that’s a good place to start, but if you already have a 150 – 175 gallon tank, git ‘er dun! Any edible species thoughts (with fins and scales) grown in the hottest area in the US? This week we will reach 126 in temperature. Looking to start in fall, but need to plan for the heat. Talapia and Bluegill seem to be it??? Love yhe info!!! Temp range for Tilapia 55F to 96F…. you might get away with a few deg. either way for very short periods of time….But believe me….they will start to die at either end of temp spread….been there done that…here in Texas…..lost fish at both extremes….cold is worse than heat though. So unless you have a way to control the temp within that range, forget about Tilapia as you must stay in that range. FOOD GRADE TANKS HAVE GREEN SCREW CAPS ON THEM.BOUGHT SOME RED,COULD NOT CLEAN THEM OF DRILLING POLYMER.SO THEY SET IN THE JUNK PILE.GOT MY TALAPI FROM FLORIDA.PUT THEM IN TANKS 2 DAYS AGO. DOING GREAT SO FAR.2 IN. FINGERLINGS.I GOT A PINK GRANITE FOR THE GROW BED.BOUGHT IT IN FREDRICSBERG TEXAS FOR YOU HILL COUNTY PEOPLE.44.00 FOR PICKUP LOAD.4 MI. NORTH OF TOWN. What size is the pink granite? Is it available in larger quantities at a better price? You know what would be great is a map of the US showing the temperature belts and the types of fish that would work well in those climates. Well, the zone hardness map for plants will give you a good idea of winter low temperatures. Average high temperatures can help determine how heat tolerant your fish need to be. However if you can shade or expose your tank to sun it can change the water temperature by several degrees. Most of the country can have high temperatures over 100 degrees. The monthly mean temperature you may get from local weather bureau is just an average of daily high and low temperatures and does not show how wide a swing there is between the high and low. Where is the best place to check state regulations? Someone told me it is illegal to keep Tilapia in many states of the US. Try your local State and Game Department. opps Try your local state Fish and Game Department. I am starting out in Aquaponics and with all the information online it can be quite overwhelming to know what system to follow that gives all the info in one package. From building the system to choosing the right fish. Have two IBC tanks and just got the first up to speed using goldfish as part of the cycling process. Been reading about different types of filters and seems a swirl filter (made from a 5 gal water bottle) is easy to make. Also a sand filter afterward then into a bed of crushed granite then into the filter media (blue/white from PetSmart), then that flows into another small tank with the polystyrene balls (spoked wheels) with an air stone keeping it churning then that flows into the sump with the pump that sends the clean water with high nitrates to the grow beds (fill and drain). These drain into another sump which is pumped back to the fish tanks. The four grow beds are 4′ wide by 8′ long and 8″ deep with that expensive clay pellet stuff. So far tomato plants, squash, cucumber, onions, and beans have all started and looking great. The IBC tanks with Fish are inside barn, one 10″ deep grow bed on top of IBC, and then other grow beds outside barn. Raised the outside grow beds to 3′ above dirt on treated 4×4 posts with “T” or “Y” at top to hold beds steady. Used CMU blocks as steady rests at 3′ intervals and grow beds slope 1/2″ from water inlet to bell syphon drain at opposite end. Tried making an activated charcoal filter but just got water dirty in process so removed it. Building swirl filter today to replace all that! thanks for sharing it was very helpful. Good information, but lacking. When the SHTF do you really believe that the electric will continue to work? When the dollar collapse comes how are you going to pay for electric if it does exist? I have built a barrow system one for the fish tank laying on it’s side, one cut in half top to bottom making two grow beds, another laying on it’s side to be the hatchery all arranged on a 2X6 wood frame creating three levels for the water to gravity feed back to the fish tank. The pump that I choose is a 12 volt DC, 700 GPH bait pump that also aireates the water (West Marine or marine supply) and will install a solar battery charger to opperate the system. The grow beds will have pea gravel and a auto siphon system. If you have the space then you should consider adding Rabbits to your survival system because of the value it offers. One doe can produce 36 kits (babies) a year or more. So a family of 4 would need 4 does, and 2 studs this equals 144 rabbits a year. The droppings make a great compost pile for raising worms to feed your fish, and the trimming from you garden will go for food for the rabbits. Rabbits are vegetarians so all you need to do is cut grass to feed them (hay). This requires very little space as a cage is generally 2 1/2 ft by 3 ft by 18 inches high and they can be stacked. This makes a fairly good ECO System. Good article about fish for in an aquaponics system! obviously like your web site however you need to test the spelling on quite a few of your posts. A number of them are rife with spelling problems and I find it very troublesome to tell the truth nevertheless I will definitely come back again.